What do we do when conflict arises in the Adventist Church? Our lesson this week begins by drawing attention to three key elements: opinion, interpretation, and unity. By the end of the week we are told that the method of averting “schism” is to follow the Holy Spirit and submit to the word of God. How is that working out for us? In the lesson introduction we read that differing “opinions” and “interpretations” of the early Christians “undermined its unity and threatened its survival.” Today, what are the opinions and interpretations that cause conflict? I don’t need to rehearse the issues here; what strikes me is the emphasis on unity and our deep fear of division in Seventh-day Adventism. Without analyzing the roots of our fear of division, let me simply posit that there is no worldwide unity of the sort being used by the General Conference to solicit fear of schism. To be clear, there is no uniform, structural worldwide unity in the Adventist Church. Perhaps a few examples will suffice. This part of our Church was pushed away by us back at the onset of World War I in Germany. Recently, in 2015, we officially apologized to them for doing so. To whom will we want to apologize one hundred years hence? Unless I’m mistaken, the General Conference has no structural, administrative control over the Church in China. “Unity” with Adventists in China then is truly a rhetorical, spiritual idea. Furthermore, from what I’ve heard, there is a split within the “Church” in China that begs the question of unity within China. One wonders how the Compliance Committees will manage issues arising in China when the GC has no control of them. Of course, some will disagree with examples of “schism” in our history. Unity in our Church now is rhetorical rather than structural. Wouldn’t it be nice to simply, honestly recognize this? That aside, let’s look at what Jesus himself had to say about when conflict arises among us. 15-17 If a fellow believer hurts you, go and tell him—work it out between the two of you. If he listens, you’ve made a friend. If he won’t listen, take one or two others along so that the presence of witnesses will keep things honest, and try again. If he still won’t listen, tell the church. If he won’t listen to the church, you’ll have to start over from scratch, confront him with the need for repentance, and offer again God’s forgiving love. 18-20 Take this most seriously: A yes on earth is yes in heaven; a no on earth is no in heaven. What you say to one another is eternal. I mean this. When two of you get together on anything at all on earth and make a prayer of it, my Father in heaven goes into action. And when two or three of you are together because of me, you can be sure that I’ll be there. 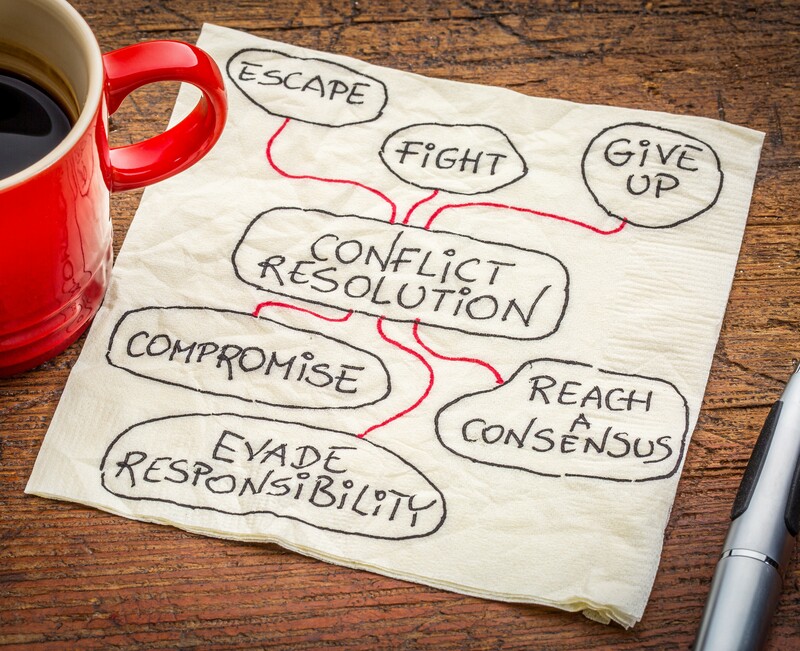 Managing conflict today should be informed and shaped by the ideas laid out here, namely, go to the person with whom you have some difference and attempt to work out a resolution to your conflict. There are situations, however, when this is approach is untenable. There may have been physically and emotionally harmful interaction between the persons involved. We should not place ourselves in situations that present the risk of harm. Secondly, in our public lives (recall that Jesus set out these ideas for persons of a faith community), at work for instance, we are often barred from approaching someone with whom we have conflict in such a direct fashion. Instead, most secular companies insist on a process dictated by the Human Resources department. I believe most of our NAD conference offices are required to have a Human Resources department or at least someone who is supposed to attend to HR issues. Surely, this will help if our processes are sufficiently informed by the Matthew 18 model. I particularly like the last couple verses in the Matthew 18 passage: “What you say to one another is eternal. I mean this. When two of you get together on anything at all on earth and make a prayer of it, my Father in heaven goes into action. And when two or three of you are together because of me, you can be sure that I’ll be there.” I wish I had a dollar for every time I failed to remind myself that what I say to others is eternal. I wish that I more routinely recognized that a relational ethic needs to pervade our faith-community conversations of conflict. We focus far too much attention on whether our positions and words are accurate or correct. Would that we focused on how our words either build or denigrate communion and relationship with each other. Imagine if our Annual Council meetings were focused on how to build community and relationships of deep trust and mutuality. Instead, when conflict arises we focus on correct policy, on positioning ourselves, punishing others, and ultimately on the elimination of those who don’t correctly follow. In this passage, Jesus calls us to a relational orientation. In ethics we call this an ethic of Care. Care ethics focuses primary attention (not the whole of our attention, but primary attention) to the relationship between persons. How can we generate and maintain relationships that reflect Christ’s love? How can we develop attractive, loving congregations? Certainly not by rooting out homosexuals and those who have the temerity of believing some part of evolutionary theory. When conflict arises across the Adventist world, I dream of Church leaders who focus on building relationships of communal understanding and a love of worship together with those of diverse understanding. Presently, however, we suffer through a duty-based orientation to disputed, authoritative rules we must all comply with. There are times when I get confused about who is more hierarchical; the Adventist church that ordained me or the Catholic company I work for. 1. Seek clarity and understanding about what exactly the issues are. How many times have you entered a conversation with the intent of convincing the other of your position? Surely (I tend to think), if I can just teach them the truth they will come around. Surely, if they were open-minded (like I am) they would see things my way. This is not a posture that will help resolve conflict. And even if you do your best to mask your end goals, others typically pick up on your goals. We simply cannot hide our basic motivations with our choice of words because our body language, our unconscious communication oozes with our internal attitudes. 2. Avoid taking uncompromising positions in a dialogue with the others. As an ethicist I have sought to help others understand that compromise is integral to conflict resolution. Compromise is not a popular idea within Adventism. Too often we fail to distinguish between our relationship with each other and our relationship with God. Of course, they are connected but the intricacies of that connection are difficult to understand. Jesus asked that we love God and our neighbor as equal commands. We don’t love our neighbor after we get it straight with God. Our love for God isn’t a precursor for our love for neighbor; they are equal commands rather than ranked commands. 3. Do not expect resolution that is acceptable to everyone. Sometimes resolution is hard to find. Denominational splits are a fact of history, even our own history. How much of our deliberations on the issue of Women’s Ordination and compliance with policy over the past fifty or more years was conducted with the expectation that we would come to a unified position? But let’s step back a bit and be honest with ourselves. What does it mean for our leadership to stand in front of us and speak about unity and the “threat” of a schism when there is no unified Church? Maybe I’m being Pollyannaish, but couldn’t we focus on our unified relationships under the Spirit’s blessing without having the expectation of one position acceptable to all? Need I quote Ellen White for the ten-thousandth time where she notes the impossibility of bringing unity via votes and policies? 4. Remain committed to the conversation and on-going relationship. a. Don’t be arrogant. Others’ positions are often just as well founded as your own even if you don’t agree with them. b. Be good listeners. When you’re not talking don’t be in the internal process of shaping your next comment. Listen with attentiveness to what the others are saying. If you find yourself talking more than anyone else, you’re talking too much. d. Value persons not statements. Our Adventist obsession with properly understanding and stating the Truth occasionally results in us running roughshod over each other and our neighbors. Regardless of what the person(s) are saying, they were created in God’s own image and are to be valued as such. e. Ask good questions. Avoid questions that can be answered with “Yes” or “No.” Asking questions is an art form and it doesn’t always come naturally. We are persons of proclamation; the proclamation of God’s end-time Truth is our specialty. Is it any wonder we’ve come to this place in our history when our focus has been so focused on building our numbers rather than our relationships? In the spirit of asking good questions, I think it may be helpful to ask what we could learn from other Christian Churches about how they have worked through conflict. The most obvious example is the Roman Catholic Church and their Canon Law. Lutheranism also developed laws internal to their faith used, in part at least, to resolve conflict when it arises. No doubt Baptists, Latter-day Saints, and most other Churches that make efforts to stay united, whether structurally or spiritually, have methods to manage conflict. Perhaps our new Compliance Committees will begin (or enhance) the development of our own set of Canon Law (Working Policy). Let’s not forget how young we are as Church. Let’s also not forget that we are a Protestant Church and debate and division is simply part and parcel of who we are. Debate is part of the fabric of being Adventist; always has been, always will be. My wish for my Church is that we learn how to argue with grace, forgiveness, allowance, and an unwavering commitment to deepening our relationships with each other rather than finding ways to divide or marginalize. I owe a debt of gratitude to Pastor Ken Curtis for his recent sermon at the Calimesa SDA Church in which he recalled Jesus’ words in Matthew 18. Thanks to my friend Warren Libby who pointed out a very useful podcast on the topic of engaging others with whom we have conflict. The podcast, The Bible for Normal People dated Sept. 16, 2018 entitled “How to Talk with People you Disagree With.” Some of the ideas in this section are from that podcast. See the Vatican’s description of Canon Law maintained on their website: http://www.vatican.va/archive/ENG1104/_INDEX.HTM . One of my Lutheran colleagues is a member of the local Evangelical Lutheran Church of America Synod’s “Consultation Committee.” See also The Lutheran Church Missouri Synod’s description of Canon Law here: http://cyclopedia.lcms.org/display.asp?t1=c&word=CANONLAW . Mark F. Carr is the Alaska Region Director of Ethics for Providence St. Joseph Health in Anchorage, Alaska. He is an ordained SDA minister with a history of pastoral and academic ministry for the Church.